There really isn’t too much to say about this other than perhaps it was a fitting end to the four pre-season games. This has been a sloppy tetralogy. Even the big positive moment — the starters in Minnesota — were let down at the end as Seattle threw away that game. One thing is pretty clear — the depth on this team hasn’t been this bad for quite some time. That won’t necessarily be an issue. The Seahawks have a quality franchise quarterback plus an offensive line and running game that has taken a big step forward. There are some question marks about the new look defense. However, the framework for a competitive season is in place even if they’re a year or two away from seriously contending again. There is one problematic statistic from this pre-season. The Seahawks only had one turnover in the four games. Remember it? The Colts back in week one had three terrible snaps from makeshift center Mark Glowinski. One ended up going over the QB’s head and into the endzone, a scramble occurred and Seattle got a lucky touchdown. That is the only turnover they have. No fumbles, no picks. That will bother Pete Carroll. Hopefully it won’t carry into the regular season. The game against Oakland was a horrendous watch (especially if you got up at 3am to witness it). Two quarterbacks destined to be cut in the next 48 hours led the Seahawks and did fairly well. Seattle’s running game had its moments again. Shaquem Griffin was probably the biggest highlight. He looks a lot more capable of handling run defense and that’s important because he could be starting in week one. He led the team with eight tackles. Damore’ea Stringfellow had an excellent long touchdown on an inch-perfect throw from Austin Davis. I’m not sure it’ll be enough for Stringfellow to make the roster. Austin Calitro might have the edge at middle linebacker following a consistent pre-season. It’s very difficult to tell what their plan is at corner. Has anyone stood out enough to write-off Byron Maxwell? It doesn’t feel that way but they might be unwilling to guarantee Maxwell’s contract given he’s been hurt. It was concerning to see Sebastian Janikowski miss two extra points. Hopefully that was only a blip. Pete Carroll talked up Delano Hill’s pre-season after the game (despite acknowledging his missed tackle today). It seems like Hill will make the roster (plus J.R. Sweezy who, according to Carroll, ‘is ready to play (next week)’). Germain Ifedi hurt his ankle and might be a doubt for week one. This is the first time in franchise history the Seahawks lost all four pre-season games. Again it’s worth highlighting the 2008 0-16 Detroit Lions had a 100% winning record in pre-season. My lasting impression from this game will be this — we don’t need four pre-season games. We’ve never needed four pre-season games. Let’s roll with two in future. As for the 53-man roster — I wouldn’t be surprised if the Seahawks are very busy over the next couple of days. The new contract for Tyler Lockett is a good thing. Lockett is a talented, highly motivated player with a fantastic attitude. He’s a playmaker in the return game, is adept at getting open and despite his lack of size, somehow finds a way to make difficult, contested grabs. He’ll earn an average salary of $10.6m a year which some people have scoffed at (more on that in a moment). Here’s the reality. He’s now the 21st highest paid receiver in the league. Such is the receiver market these days, that ranking will only get lower over time. Lockett is earning less per year than Davante Adams ($14m), DeSean Jackson ($11.2m) and Emmanuel Sanders ($11m). He’s earning a bit more than Randall Cobb ($10m), Donte Moncrief ($9.6m), Pierre Garcon ($9.5m) and Marqise Lee ($8.5m). When placed in that context, Lockett’s contract makes perfect sense. The market for a good #2 receiver — or even an average #2 receiver — is in the $9-11m range per year. Is Davante Adams worth $3.4m more per year than Lockett? I’d argue not — at least not without Aaron Rodgers throwing the ball. This is exactly the type of deal you’d expect Lockett to get. He’s a player the Seahawks really like on a second contract. So they got it done. However, there seems to be some consternation purely because Paul Richardson received a smaller contract from the Redskins ($8m per year). You can always rely on Seahawks twitter to find something to moan about. For me it’s an unnecessary qualm. The Seahawks weren’t going to pay both players. They’re already paying Doug Baldwin $11.5m a year. They recently paid Duane Brown and Justin Britt. Russell Wilson is going to get a mega deal soon. The promise of David Moore also likely gives the Seahawks confidence they can progress without having to pay three receivers good money. They preferred to pay Lockett. His return value was likely a factor, as was his production. Richardson has a long history of injuries while Lockett has experienced a broken leg (and seemingly made a good recovery). The difference in salary is $2.6m. It’s not insignificant but it’s also not exactly back-breaking. If they preferred Lockett, it’s not a restrictive amount. It feels like sometimes there’s a tendency to over-analyse every decision. Every spare million is accounted for. That’s understandable to an extent. Yet increasingly it feels like we’re surrounded by self-trained experts, pontificating as if they have all the answers. The obsession about the running game being a case in point. Sometimes it’s OK to reflect on a contract and accept the Seahawks kept a player they really like. It’s possible you think Paul Richardson is a better player. The Seahawks clearly felt otherwise. I’m not sure they’ll ever regret the $2.6m per year difference they spent to keep the player they wanted. And while we’re on the topic — it was noticeable that some people found reason to criticise the decision to trade a 6th round pick for Brett Hundley. Perhaps the PCJS era has given us fans a warped sense of what a late round pick is. They’ve had so much success, even recently (Chris Carson, David Moore, Michael Dickson). A bit of context is also required on the Hundley trade, however. 1. The Seahawks clearly didn’t see any upside in keeping Austin Davis on a salary worth nearly $1m. 2. Alex McGough has flashed some talent but also looks incredibly raw and ill-prepared to play a half of regular season football, let alone a stretch of games. He needs time. Is he likely to be claimed by another team if he’s cut? No. Should the Seahawks find it relatively straight forward to stash him on the practise squad? Yes. If he is claimed by someone else is it the end of the world? Absolutely not. 3. Brett Hundley isn’t particularly good. However, he has proper game experience. If he’s needed to come into a game and get Seattle over the line, that experience could be important. He’s both superior to Davis and better prepared than Alex McGough. For the price of a sixth rounder, Seattle brought in a backup they’re more comfortable with for 2018. They also get to take a look at Hundley to see if he’s someone they view as a possible long term backup option. Both the Lockett extension and the Hundley trade should be viewed as decent moves. Neither will be as impactful as say a Khalil Mack trade. Neither is worthy of any negative reaction either. For some reason we seem to live in a time where people can’t just say, ‘OK, cool’. Everything is either extremely good or worthy of a string of passive aggressive tweets. Social media has changed our culture forever. Not in a good way. As projected in yesterday’s piece, Seattle’s 2018 backup quarterback wasn’t on the roster. #Seahawks are extending WR Tyler Lockett: three years with a base value of $31.8 million, max value of $37.8 million and $20 million guaranteed, source says. Another deal the team wanted to get done before the season. Keenan Reynolds to make the roster? I have a feeling he will. They’ve made a big push to involve him in the pre-season with the starters. He’s basically been Doug Baldwin so far, featuring in the slot. And Russell Wilson went to him for key third down conversions against Minnesota. Reynolds had four targets against the Vikings — no receiver had more. He’s also a useful special teamer. Yes it’s a very competitive group at receiver this year. However, the Seahawks have regularly ‘stashed’ a player over the years — Kristjan Sokoli, Benson Mayowa, DeAndre Elliott. I wonder if Reynolds will get that spot this year? Especially with question marks over Baldwin’s knee. The Seahawks are usually busy at the end of pre-season, making deals and bringing in players cut by other clubs. This worked particularly well a year ago when they traded for Justin Coleman. With this being a competitive refresh for Seattle, I wonder if we’ll see more moves than even last year? There are question marks at cornerback, the pass rush, linebacker depth, fullback, tight end and quarterback. So while everyone’s busy doing their 53-man projections — four or five new players might be added before the regular season starts. Will they cut Ed Dickson? Probably not yet but they might do eventually. Dickson hasn’t featured at all in camp or pre-season. If they put him on the PUP-list it buys them some time. If there’s no sign of a return, they might just rip off the band-aid. It’d be costly. It would cost an extra $1.8m in dead money to move him on — but his $4.5m cap hit would be off the books for 2019. Unless Dickson gets healthy soon, it might be best to move on. For now, the PUP is a good option. He took forever to sign a contract in Seattle and he hasn’t been practising. It might be time to move on to ensure his contract isn’t guaranteed. That would leave the Seahawks thin at corner but if Maxwell is injured they will be anyway. They might need to check out the trade market here. If Maxwell departs, corner could be a problem in 2018. Poona Ford is cheap and looks at home in the NFL. It’s not worth risking losing him to try and sneak him onto the practise squad. If you have to carry another defensive lineman, so be it. They need depth at running back so Mike Davis should make it along with Chris Carson, Rashaad Penny and C.J. Prosise. Jacob Martin looks too quick and full of potential to risk losing and Erik Walden showed against the Vikings he’s worth keeping as a pass rush specialist. What will they do at backup quarterback? They know what they have in Austin Davis. That’s probably why he barely had any snaps against the Vikings. They wanted to get a good look at Alex McGough. While he didn’t play badly at all, he equally didn’t look ready. He needs time. Yes — Seattle’s season won’t survive if Russell Wilson gets hurt and misses a long period of time. That’s not what a good backup is about. It’s about being able to hold the fort if you have to play a game or two or even just a half or a series. Davis, admittedly, is a limited QB. Yet his experience and control might be more useful to the Seahawks if they need to try and win one game during the season. Is McGough likely to make the practise squad? I think so. Who takes him for their roster? The wildcard is whether they try and add someone from the outside. It’s distinctly possible — either via trade or collecting a cut QB. There are teams with multiple decent backup options at the moment. Seattle’s backup QB in 2018 might not currently be on the roster. If you missed the early 2019 draft watchlist, check it out here. This is a really exciting year. I’ve been doing this blog for a decade. I can’t remember having this many defensive linemen on the early watchlist. The Seahawks could well be in the D-line market in the off-season, so this is good news. I’ve spent the last few weeks watching the players below. Before the college football season begins, here are my thoughts on an intriguing group. Spoiler — I really like two linebackers. He’s the real deal. Fantastic quickness off the snap just like his brother. Incredible agility and bend plus the power and size to win in different ways. I think he’ll run a bit faster than Joey (apparently Nick runs a 4.57). If none of the quarterbacks rise to the top, Bosa has a legit chance to be the #1 pick. He had 16 TFL’s in 2017. ESPN’s #3 overall recruit in 2016 (behind Rasharn Gary and Greg Little). Incredible talent. The kind of player who can transform a pass rush. Ferrell wows you with his size, speed and potential. His get-off is outstanding and he’s perfectly capable of exploding off the EDGE as a speed rusher or handling the tougher duties in the run game. Some believe he could add weight and kick inside but he can pretty much do anything. It’ll be a surprise if he doesn’t go in the top-10 next year. He would’ve been a high pick this year but chose to return to Clemson in a pact with Christian Wilkins and Austin Bryant. Ferrell had 18 TFL’s in 2017. He ran a 4.87 at 289lbs during the SPARQ workouts. He also added a 4.52 short shuttle and a SPARQ score of 105.63. Oliver is lightning quick and extremely agile for his size. If he wants to play inside permanently he might need to add weight but he’ll get to the combine, have a sensational workout and likely find a home in the top-10. He had 16.5 TFL’s last season. ESPN’s #4 overall recruit in 2016. Just an enormous, powerful and highly athletic monster. He’s 6-7 and about 305lbs. You immediately think about Calais Campbell at that size but Davis is a little less beastly and quite a bit quicker than Campbell. He scored a 93.63 at the SPARQ workouts which is decent for his size. Davis looks like he was made for the NFL. Exciting. Who doesn’t love a high intensity, physical wrecking machine at linebacker? He’s intense and powerful — a genuine BAMF. Walker gets into the backfield with quickness and power but he’s also a useful blitzer on stunts. He’ll engage a lineman and win which is impressive for his size — plus he’s adept at disengaging to make a TFL. As a gunner on special teams he has ferocious potential. Walker jumped a 33 inch vertical at the SPARQ tests and his 4.16 short shuttle is in Leighton Vander Esch territory. He had a sack vs Florida where he drove two offensive linemen into the QB. Walker is all about determination and will to win. Love him. He’ll set the tone. He had 13.5 TFL’s last season (the same number as Shaquem Griffin). White absolutely flies to the ball. His ability to find the gap as a blitzing linebacker is highly impressive and he makes a ton of plays. There are similarities to Jarrad Davis. He ran a 4.57 at 260lbs at the SPARQ tests and also recorded an 4.36 short shuttle, a 34 inch vertical and a 122.19 overall score. First round talent and like D’AndreWalker, an intense tone-setter who will lead a defense. Both Walker and White are terrific, fun players to watch with legit NFL potential. An athletic nose tackle and we’ve seen how early these players go in recent years. He’s big, strong but not quite as freaky as Vita Vea. Lawrence still ran a 5.03 at 335lbs at the SPARQ workouts, plus an outstanding 4.61 short shuttle. At that size, it’s a wow time. He’s a 88.98 SPARQ athlete. You see him very capable of holding the point as you’d expect but there’s some pass rush in there too. Can he show even more in 2018 to land a high grade? ESPN’s #6 overall recruit in 2016. Round one lock. After Walker and White, I think Edwards was the player I most enjoyed watching. He’s a tone setter and an ideal right tackle. He’s in control, he’s physical. He’s exactly what you’d expect from a blocker from Wisconsin. Having watched his interviews and a segment on his personality, he’s clearly the right type of character you want on your team. He looks the part, lives the life. I really struggled to find any flaws in his technique. Tough, physical. Great prospect who will go early. Gary hasn’t been as spectacular as Bosa or Ferrell so far but you see little flashes of greatness. Now he needs to dominate this season. He ran a 4.86 at 287lbs so he’s a similar athlete potentially to Ed Oliver. He also ran a 4.59 short shuttle and had a 95.82 SPARQ score. You can see the physicality and the talent is there. He’s a top-10 type. In 2018 he needs more than just the six sacks and 12 TFL’s. It’s time to dominate. ESPN’s #1 overall recruit in 2016. Perfect three-technique frame, excellent mobility for his size and fantastic quickness off the snap. Wilkins can chase across the line and regularly makes tackles away from the LOS. He shows great variety to win with quickness, technique, speed-to-power and can drive a guard into the backfield with a bull rush. Excellent, valuable interior player. The Gators have become a school for great safeties and Gardner looks the part. He’s incredibly fast and dynamic and runs with the kind of range you want to see from a top free safety. He’ll hit you given the chance but it’s his speed and range that make him intriguing. He’s had some rough moments (see: Tennessee, 2017) but overall there’s a ton to like about his game. ‘Violent’ is the best way to describe Brown. His body slam tackle in the UCF game highlights that. He does two things really well — he controls the line of scrimmage and he has just enough pass rush to be an every down DT. He has the ideal frame for a three technique. Testing will be key though because he only scored a 64.38 in SPARQ. ESPN’s #9 overall recruit in 2016. Harris was a blog favourite last year. He has the ideal size and frame, explosive traits, he’s a plus pass blocker and he’s can get the hard yards and also act as a home run hitter. If he gets the bell-cow workload in 2018 he’s a strong Heisman candidate. He’s not Saquon Barkley as a talent but he has an extremely robust set of skills. The big thing for Trey Adams is to prove he’s back to his best following the knee injury. If he can do that, he could be the first tackle off the board. He’s tall and long and very capable as a pass blocker or run blocker. He’s the kind of solid, consistent tackle prospect that regularly goes in the top-15 these days. Little handled Alabama’s Da’Shawn Hand last year and does a very good job getting to the second level. His hand placement is good and he doesn’t overextend. I just want to know official numbers on his size and length. I wondered, watching him on tape, whether he was more suited to being a big guard. Still, he’s a likely first round pick based on the NFL’s desperate need for offensive linemen and Little is very accomplished and in control of his blocks. ESPN’s #2 overall recruit in 2016. Jackson has a terrific frame with ideal size. He has the quickness and the length. You watch him and see a complete package. I’m wary of an underwhelming 80.31 SPARQ score but he didn’t appear to lack explosive athleticism on tape. He looked beastly at times and a big year in 2018 could propel him into round one. He looks the part, now it’s time to deliver. 11.5 TFL’s last season. Lock has a snappy, quirky release which is quite low and might scare teams focused on technique. Yet there’s no denying he really fires the ball out. His arm strength is impressive. In terms of accuracy and consistency? He needs to take a step forward there. He seriously considered declaring this year. Can Missouri support him well enough in the SEC? Of all the QB prospects he and Jarrett Stidham have the best chance to rise in a down year for the position. Twitchy, long, balanced pass rusher. There are moments where he bends round the arc and straightens to the quarterback and you take notice. Like Joe Jackson, you see a LOT to like and he has the potential to go very early with a big 2018 season. He can stand to add weight to his frame and get into the 255-265lbs range. He’s a 92.04 SPARQ talent and looks explosive. Had a great freshman season but didn’t hit the heights in 2017. Big opportunity this year. This was a fun watch. Ledbetter has a motor, he’s quick, he works through traffic and defends the edge well. He was the #61 overall recruiting talent in 2015 (per ESPN) and you can see why. He’s particularly good defending the run but he offers enough speed as a pass rusher to think he could be really effective at the next level. Really like him. Needs more than 5.5 TFL’s this year. Bryant didn’t go into the 2017 season getting the reviews of Ferrell, Wilkins and Lawrence. Yet every time I watched Clemson he found a way to make a play. He ended the year with 15.5 TFL’s and was touted as a likely first round prospect (before he chose not to declare). Testing will be big for Bryant (he only managed a 76.35 SPARQ score). Auburn’s season really came to life at the end of 2017 thanks to an angry defense, Kerryon Johnson and Stidham’s calm head at quarterback. He’s methodical, accurate and assured. He’s also elusive and ran a decent 4.66 at SPARQ. This is a big season for Stidham. Some of Auburn’s big rivals might take a step back this year. Can Stidham lead them to the SEC Championship again and boost his own chances of being a high pick? I thought he looked terrific as a potential slot corner. He’s instinctive and competes against bigger targets. He shows good reactions to play the ball. He had an elite 140.16 SPARQ score (including a 42 inch vertical and a 4.38 forty). He won’t be an outside corner for a lot of teams at his size but Jaire Alexander and Jason Verrett were both high picks. He looked better than I expected. He’s a quick and thick set receiver and he only managed a 27.5 inch vertical at the SPARQ workouts. Yet here he was — running deep, making plays, juking between tacklers in the open field. He’s surprisingly shifty and quick enough for his size. Testing is key but there are things to like here. He plays with a purpose. Johnson’s physical, fast and makes plays. He’s the captain on Miami’s defense and plays with a fantastic zest and attitude. He only ran a 4.68 at SPARQ testing but he looks a lot quicker on tape. He can push up to the line and play the run, he tackles well in space and he’s quick to cover. Chunk play specialist. He has a thick frame (a bit like Brown) and he’s more elusive than you’d expect. It catches you off guard. He looks a bit like Torrey Smith in that regard. Samuel has excellent straight line speed and excels as a returner. Has the frame to be more than just a deep threat. There’s no doubting Love is an electrifying talent. You do have to wonder about his size though. Plus, Stanford has had a number of prolific runners in recent years. When everyone gets bigger, faster and stronger at the next level — are the big lanes going to be open for Love? Can he create on his own? Can he get the hard yards? He’s really good but might have to be part of a duo. More of a hybrid slot but very capable of coming up to the line and hitting. His range looked good on the few examples I could find. He has decent size and NFL bloodlines. Reed is an excellent tackler and he won’t have any issues working against the bigger bodies at the next level. I’m not totally sold on Baker. Admittedly he ended last season well and impressed against Auburn, Oklahoma and Alabama but he too often loses track of the ball. He ran a 4.64 at the SPARQ workouts and only managed a 81.57 SPARQ score. He is a good tackler and squeezes receivers well to the sideline. Does he have first round upside though? Not sure. I didn’t really know what to make of Allen. His frame and size aren’t easy to place. Does he have to kick inside? He lacks speed and doesn’t look like a top athlete but he can control blockers, disengage and he’s capable of knifing into the backfield. He had 15.5 TFL’s last season. He didn’t scream first round to me but he does have production. ‘Proper’ linebacker. Only a two-star recruit and might not have great testing at the combine. He plays with physicality and passion. Looks quite heavy but seems to make enough plays dropping into coverage. Has had a number of interceptions including a superb one-handed catch against Iowa. Probably won’t go early but fun to watch. Both Edwards and Washington defensive tackle Greg Gaines (who I like a lot) might be mid round picks who stick in the league for a long time. He’s very controlled and reads plays well. Allen offers some rush off the edge. At times he looks really good but he’s maybe more of a situational rusher than a pure DE. He allows plays to develop and doesn’t over-pursue. How athletic is he? That could determine whether he gets into round one contention. The best run defending DE I watched. Buggs controls his edge very well, has the ability to run down ball carriers to the sideline and he’s physical and tough to move off the LOS. His best skill is his ability to bench press and flatten, push the lineman into the pocket and disrupt run and pass plays. Buggs isn’t a twitchy EDGE and his value will be limited as a consequence. As a very solid, powerful DE — he will be reliable. He could also play inside. He’s often projected as a really early pick but I wanted to like him more than I actually did. There were a few double catches and plays where he didn’t high point the ball. There are also some examples of speed and boxing off defenders. I didn’t feel like I was watching a first round prospect based on his 2017 play and usually it’s easy to identify the round one receivers. There are things to really like about Williams, especially his size and clear athletic potential. He’s like a more athletic DeAndre Baker. Both players struggle at times to track the ball in the air but the difference between the two is if you work out Williams’ technical flaws, he has the upside to be really good. It’ll be interesting to see if he can take the next step. I’ve also watched Montez Sweat (DE, Mississippi State), Jonah Williams (T, Alabama) and Jason Jelks (DE, Oregon) but wasn’t particularly impressed. Sweat seems quite overrated, I wonder about Jelks’ next level fit and Williams doesn’t seem to be a next level left tackle. I’ll modify the list as the season goes on and new names emerge. If noticeable players are absent, it’s probably because I haven’t watched them yet (eg a couple of the bigger name quarterbacks). If you’ve seen someone who stands out, let us know in the comments section. It’s never worth overreacting to pre-season. It’s why the OTT negativity after the Chargers loss was unnecessary. Today was a very different game and Seattle’s starters looked decent after a couple of long Minnesota drives to begin (expected against a good opponent). In particular, Seattle’s offense and running game were highlights. — Germain Ifedi was hammered last week by the local media and the fans. The social media silence (with a couple of mild exceptions) after a much improved performance today was disappointing. Be fair to the guy. If he gave up the three yard loss suffered by Mike Davis in the second quarter, Twitter would’ve lit up. Instead it was Duane Brown (who had a tough day against Anthony Barr too). Ifedi handled his business and after a week of negativity it’s time for some balance. — The thing to take away from the Ifedi silliness this week is the reminder that tackles in the modern NFL will get beat. Many are overmatched. We’ve been over it so many times, as has John Schneider. College football is not producing pro-ready linemen. The top High School athletes are choosing to play defense. There’s a problem. Guys like Melvin Ingram are a nightmare for most tackles. I’d recommend going to Field Gulls and reading Kenny’s piece on the tackle duo’s for each NFL team (NFC, AFC). It’s an eye opener and clearly lays out the league-wide problem. — George Fant also had a positive performance after collecting some snaps with the #1 offense near the end of the first half and staying in for a lot of the second. — The running game looked good. Seattle’s long second drive was a nice mix of run and pass culminating in a touchdown for Chris Carson. Mike Davis ran the ball with authority (and surely must make the roster). Russell Wilson’s protection was good and the the quarterback was again on point. This was extremely encouraging against a strong defense on the road (even if the crowd seemed a little preoccupied and quiet). — The best thing about the running game was the relative ease Seattle picked up 4-6 yards in the first half. This is how you make life easy for the QB, this is how you keep the defense honest and this is why the running game does matter. — The defense gave up a number of third down conversions in the first half. Some of them were a little too easy (throws to the RB, missed tackles or poor coverage). Yet on the plus side, they consistently hit and pressured Kirk Cousins. The Vikings O-line is poor but Seattle was aggressive and willing to attack. It had an impact. — K.J. Wright on Stefon Diggs. Who needs Kam Chancellor? Wow. Talk about a hit to set the tone for a new season. Well done the refs for not flagging it. — Michael Dickson is fricking awesome. — It was also comforting to feel confident with Sebastian Janikowski, while the Vikings’ rookie kicker toiled and missed two kicks. Their faith in Daniel Carson is surprising. They cut Kai Forbath to roll with Carson. Anyone who watched him at Auburn will know how inconsistent he is. He’d nail a long kick and miss two easy ones. Janikowski’s 55-yarder to make it 13-6 was particularly enjoyable. — Brandon Marshall needed to make some plays. He did that today. Whether they trust him to be available for a whole regular season will likely determine his future. If he’s on the week one roster, his contract is guaranteed. So that’s a big decision to make. Marshall did show he can have an impact though. He’ll be a tempting keep. They also made a point of involving Keenan Reynolds. Does he have enough special teams value to make it? Maybe. Can they get him on the practise squad? Wilson seems to trust and like Reynolds. He also made a terrific 34-yard perfect throw to Marcus Johnson, who completed a difficult grab. Nice play — and the competition at receiver is legit. David Moore is a lock though. — Another seasoned vet, Tom Johnson, equally had an impact on the D-line. He was highly disruptive against his former club. A big plus. — Barkevious Mingo’s special teams hit before half time was delicious. He missed a tackle but also broke up a two-point conversion, made some plays at the LOS and looked highly athletic. A good day overall. Jacob Martin looks way too quick not to make this roster as a useful backup to Mingo. Poona Ford also had another nice day. Considering the Seahawks have stashed a player for years (even with a deeper roster) I can’t think of a reason not to keep Ford. — Erik Walden had an immediate impact with a sack in his first game to end Trevor Siemian’s first drive. In fairness though he went up against rookie tackle Brian O’Neill who gave up exactly the type of pressure he conceded all week at the Senior Bowl. Walden’s second sack was unblocked but this was a decent start. — The Seahawks only have one turnover in pre-season so far — the botched Colts snap that bounced around and led to a fortunate Seattle touchdown. That might be a cause for frustration/concern. — The backup quarterback competition remains murky to me. Alex McGough led a scoring drive but mostly succeeded using his legs. Austin Davis was handed a dose of conservative play calling and did little with it. They may well keep McGough for upside and cost but to me it’d be a little concerning to know you’re an injury away from sending out a seventh round rookie QB. We know Davis can manage a game (he did, after all, once beat peak LOB). I think if they could find an experienced outsider, they might do it. And that’s not a slight on McGough. He needs time. — It doesn’t really matter but they threw the game away at the end. Seattle moved to 0-3 in pre-season. It’s also worth noting the 2008 0-16 Lions went 4-0 in pre-season. So it’s not a problem per se but it was irksome to lose. The Seahawks tried to trade for Jacoby Brissett? As for Brissett, he isn’t going anywhere this year, given Andrew Luck’s tenuous shoulder injury. Our league source said the Seahawks recently offered a second-round pick for Brissett, who was coached last year in Indianapolis by current Seahawks quarterbacks coach Brian Schottenheimer, but the Colts passed. This jibes with owner Jim Irsay’s recent comments, that the Colts wouldn’t even trade Brissett for a first-round pick. But next year is a different story, and Brissett will be a free agent after 2019. The Patriots liked his toughness and composure, and they could look for a reunion down the road. I’m not really sure what to make of this. The Seahawks don’t even have a second rounder in 2019, so it would need to be their 2020 selection. Are they really open to trading their 2018, 2019 and 2020 second round picks away? Brissett is out of contract in 2020 so it wasn’t merely a cost-effective move to get a very good backup QB on a small contract. This would’ve likely meant giving Brissett a decent extension at the end of the season. And if it’s about planning for a possible life after Russell Wilson, would you rather pay a proven Super Bowl winner the biggest contract in the league or would you rather pay Brissett more than he’s proven to be worth? It would’ve also created a huge storyline and possible distraction this season. Everyone would be asking — what are they doing? What’s the plan here? And the speculation over Wilson’s future would go into overdrive. It’s the Boston Globe not some spurious rumour, so it’s worth paying attention to. On top of John Schneider visiting all the top QB pro-days in the off-season — are the Seahawks covering all bases and trying to gain leverage in contract talks? Or are they seriously considering moving on and avoiding the huge cost of paying Wilson a third contract? For what it’s worth I’ve always liked Brissett. We wrote about him a lot after he switched Florida for NC State. He played well for the Wolfpack showing decent physical skills, accuracy, the ability to extend plays and a strong enough arm. Consistency was an issue though. It wasn’t a surprise he went in the third round to the Patriots in 2016. It was a bit surprising they gave him away for Phillip Dorsett. On a bad Colts team last year he started 15 games and threw 13 touchdowns and seven interceptions for 3098 yards. He added four rushing scores too. He’s a good player. Whether he’s worth a second rounder to put pressure on Wilson to accept a smaller contract extension, well I think we know the answer to that. It’s a bizarre story. Life’s never dull with the Seahawks. You can’t help but wonder what the future of this team is going to look like. The Seahawks in 2018 will only go as far as Wilson can take them. A future without Wilson is unthinkable. Maybe it shouldn’t be? Jason La Canfora is well connected to the Seahawks and has broken numerous stories on the team over the years. So you can trust this has come from the team. What a weird day. Note — I posted some game notes after the Chargers loss. You can read them here. — This was sloppy by Seattle. Obviously there were some positives. Russell Wilson made some plays downfield, the running game looked extremely sharp early in the game and there were a handful of good individual performances (Rasheem Green, David Moore & Michael Dickson in particular). Yet the penalties, relative ease that all three LA quarterbacks moved the ball and cheap points conceded were bothersome. The big run at the end to ice the game was especially frustrating, preventing the Seahawks from having one last shot to get an undeserved win. — It’s easy to overreact to a game like this but maybe it’s a good thing? There’s certainly plenty to work on. In particular the three LA touchdowns can be a point of emphasis. Philip Rivers made an incredible play to start his day but then didn’t need to break sweat for the rest of his scoring drive. The kick return score was just too easy and Mike Williams beat Akeem King in the second half. Cheap points. In comparison Seattle contrived to make life difficult. Chris Carson’s fumble took points off the board, the Will Dissly penalty was nitpicking but also took points off the board. There also wasn’t much rhythm to Seattle’s play after a fast start. They just had a lot of deep throws but to their credit, the receivers came up big. — In fairness to Jon Ryan — a fantastic Seahawk — Michael Dickson has surely got the punting gig. Along with Rasheem Green and Jacob Martin, the rookie class again provided some highlights. Quinton Jefferson also continued his good pre-season while Jaron Brown and David Moore showed they’ll be able to contribute this year. Already it feels like the only decision left to make at wide out is whether to keep an extra one and stash Damore’ea Stringfellow. — The Chargers had 176 rushing yards. Too easy tonight. — Twitter is focusing on Germain Ifedi but I really hope he isn’t going to be a scapegoat this year. He was beat badly by Melvin Ingram for a sack. Duane Brown also gave up an easy pressure in the first half. It’s going to happen, especially against a team like the Chargers. I think already we can see the first team O-line has taken a big step forward this year. We don’t need to overreact to every sack. I’d urge people to watch some of the other teams in pre-season because it’s been one bad O-line after another so far. — Alex McGough looked good tonight on his touchdown drive. He had some nice throws to set up the opportunity and finished with style. This was a good positive step forward for McGough on a night when Austin Davis struggled to move the ball. I’m still not convinced the Seahawks will be entirely comfortable going with a rookie backup but Davis has to show better next week. — Seattle’s 2017 draft class could provide some real quality in the form of Carson, Naz Jones, Shaquill Griffin and Tedric Thompson. But it’s tough to look at the front end of the class. Malik McDowell is out of the league and it’s fair to wonder whether Amara Darboh and Delano Hill are going to stick around much longer. That’s a second rounder and two third rounders spent on very little. — Tonight painted a very clear picture on what will make or break Seattle’s season. Everything will be down to Russell Wilson and the running game to cover some of the other issues. The defense will likely give up more points. They’re going to need to put points on the board. This feels like a team that needs another draft and free agency to get back to the kind of level where they’re truly competitive. — Rasheem Green looks great. Frank Clark will do what he does. This team badly needs at least one other D-line pass rusher. Thankfully this draft is loaded with defensive line talent. Later this week I’ll be posting a 2019 watchlist for the new college season. Kenny and I will also be recording a podcast on Sunday going over the Chargers game. Chris Carson looks great. Rashaad Penny has a broken finger. Why did they spend a first round pick on him again? It’s important to remember where the Seahawks were a few months ago. Pete Carroll wants to run the ball. You might disagree. You might wish for a different approach, a more pass-centric offense. Yet Carroll decided who he is as a coach a long time ago and it involves running the ball as a feature. Seattle’s running game wasn’t even hopeless last year. It was worse than anyone could ever imagine. It was probably embarrassing for Carroll. To have the quarterback be your leading rusher, to have only one touchdown by a running back, to be so utterly useless in the red zone. Heck, to be so utterly useless in any situation. And yet the win against the Eagles showed how good the Seahawks could be with a balanced attack. Part of the issue was a bad O-line. Part of the issue was injuries to the running backs. Part of the issue was a lack of talent at running back. So the clear focus this off-season was to fix this problem. Not so fast though! The Seahawks had a bad cap situation and needed to move out several players to work their way out of a hole. On top of this, they’d spent their second and third round picks on Sheldon Richardson and Duane Brown in an attempt to make one final bold push for a Championship with the old guard. Now they had hardly any cap space, weak draft stock and a growing list of needs. They simply didn’t have the cap flexibility or draft picks to address all the problems in one off-season. So they prioritised. They needed to boost the running game. They needed a pass rusher. They had pick #18 and turned it into Rashaad Penny and Rasheem Green. For what it’s worth, I’d mocked Green in round one many times. Lance Zierlein in his NFL.com blurb described Green as a potential top-10 pick in 2019 had he returned to USC. He lasted into round three and Seattle took a punt on him. They also landed the running back they wanted, not the one who happened to be left on the board. The hand-wringing over the Penny pick now seems to be over whether he was even needed with Carson on the roster. Yet people forget how unreliable Carson has been in his career so far. As talented as he is, he hasn’t been able to stay healthy. He played four games for Seattle in 2017. He only had 82 carriers for Oklahoma State in 2016 and 131 carries in 2015 — missing several games. Who else was on the roster? The perennially injured C.J. Prosise and Mike Davis. 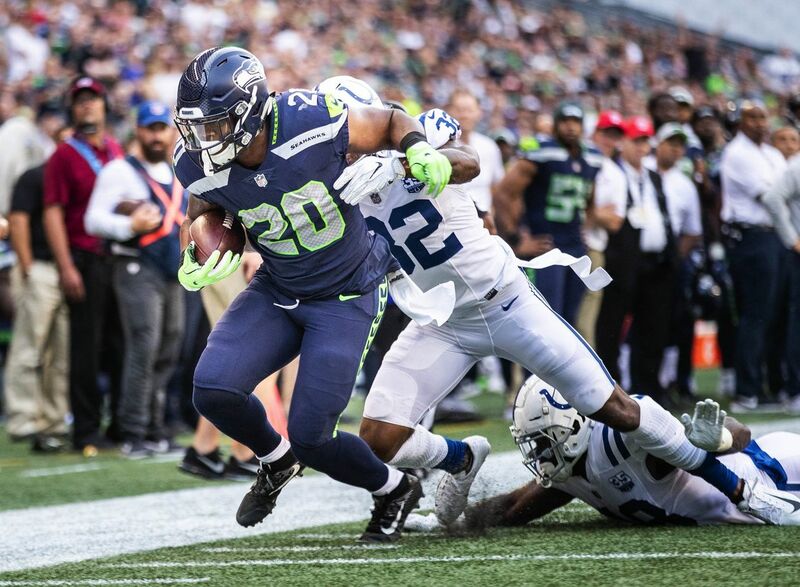 Could you really go into the 2018 season hoping for a change in fortune for Carson and Prosise? Would it be acceptable for a team so determined to dominate with the running game to carry only one semi-reliable runner in Davis? They could’ve added a free agent but that backfired emphatically with Eddie Lacy. They took their guy. They looked at a really good class for running backs and chose who they wanted. Rashaad Penny. Only Saquon Barkley was off the board at #27. They had their pick of a really good crop. Had they not taken Penny at #27 the alternatives could’ve been Austin Corbett or Will Hernandez. Both players are really good and we spoke about them a lot pre-draft. Yet the Seahawks had only just traded for Duane Brown and spent a second round pick on Ethan Pocic. They’d signed D.J. Fluker, who they appear enamoured with, and neither Corbett or Hernandez was an ideal fit at right tackle. Perhaps they could’ve taken a pass rusher at #27? Maybe. Yet there were plenty of concerns about the somewhat overrated Harold Landry. Certainly enough for him to drop to #41 when many expected a home in the first round. For the purpose of the argument though, let’s give the Seahawks Landry at #27. So now they’ve addressed the D-line. Their next pick is at #79. By that point virtually all of the top running backs are gone. Remember, Carroll wants to run the ball. That’s the identity of his team. The next running back to leave the board was Nyheim Hines in the fourth round (#104 overall). By not taking your pick of the running backs at #27 you miss out on the good ones. So you probably double-dip on defensive linemen right? Take Rasheem Green to pair with Harold Landry. Not a terrible plan by any stretch. Yet you’ve still not addressed the running game. The key priority. Your next pick is #120. A couple more runners leave the board. Do you take one here? Only if you want to miss out on Will Dissly — a player who appeared to be specifically targeted to also help Seattle’s running game. How much longer are you going to await to address this need? And again, let’s say you just roll with Chris Carson and hope for the best. Hope he stays healthy. What if, like the previous three seasons of his career, he isn’t available to take on a full work load? What if he misses numerous games again? What if the running game, for the second year in a row, is horrendous? Carroll again doesn’t have his preferred identity. He’s not accomplishing his vision. They’re not playing his ball. You can’t win that way. We saw what a team minus any kind of direction or identity looked like. It’s called the 2009 Seahawks under Jim Mora. Can you find running backs later in the draft? Absolutely. Let’s not pretend it isn’t possible for every other position though — or fail to recognise many of the top backs are drafted early. Ultimately I think this best sums it up. Seattle took the second best running back in a draft billed as the ‘year of the runner’. They also manipulated the board to get a very intriguing pass rusher in round three. They still have a big need on the defensive line but guess what? The 2019 draft will be billed as the ‘year of the pass rusher’. Guaranteed. Next years draft will be loaded with defensive linemen. Considering this isn’t a one-year reset, they probably played the draft the right way in 2018 while setting themselves up for next year when there’ll be a lot more cap space and a D-line friendly draft class.